A quarter of all adults struggle with foot-related issues, and among people with certain types of arthritis, including rheumatoid arthritis (RA) and osteoarthritis (OA) of the knee, hip, ankle or foot, it’s even more prevalent. Foot discomfort and structural problems such as the hammertoes and bunions caused by the inflammation of RA and lupus also can spread beyond the feet, leading to shin pain, knee pain and lower back pain. Orthotic insoles redistribute weight and relieve pressure on sensitive areas of the feet, provide cushioning and support that reduces stress on the lower body, and correct gait and structural abnormalities such as overuse injuries, weakening of the arch, overpronation, supination, nerve damage, heel pain, inflammation, plantar fasciitis and other painful orthopedic issues. Custom moldable orthotic insoles are a cost-effective solution designed to improve alignment and provide the mechanics you need to stay on your feet. One the most important aspects of custom orthotics is to match the shape of the insole to your foot. 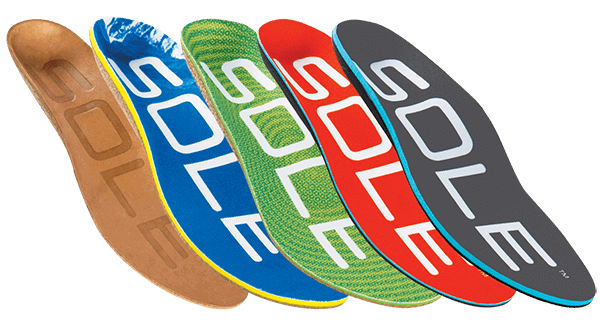 SOLE’s heat/wear moldable orthopedic bases adapt to the exact contours of your feet without compromising the orthopedic shape, providing you custom comfort at an affordable cost. Getting custom-fit footwear has never been easier. Whatever your lifestyle, think about what’s in your shoes and how a little customization could take you a long way to greater comfort, injury prevention and much-needed relief from arthritis-related pain. SOLE’s award-winning custom moldable footbeds form to the shape of your feet for support exactly where you need it and are designed to improve alignment and provide the mechanics you need to reduce arthritis-related pain and prevent further injury. I purchased a pair of the heatable soles yesterday on the advice of my orthopedic surgeon. I have worked in a factory for 30 years. My feet are shot!! I have arthritis in both feet and ankles. I have fallen arches so badly that I have had to have foot fusion on the right foot. I now have a 3 inch screw from my heel to my ankle. I have had joint replacement on the great toe of the left foot. I also have had polio as a child. I have lived with foot pain for over 35 years....until NOW! I worked all day today and I have NO PAIN in my right foot at all. My left one is sore because I had surgery just four weeks ago. This is a real miracle for me. You may think I am exaggerating but you have no idea how much pain I have been in until now. I went to the store and bought a second pair right after work!!! I have told all my co-workers that have foot pain about these soles. Help for arthritis. My rheumatologist told me to try SOLE inserts instead of custom orthotics, saying they were just as good and much less expensive. WOW!!! Just finished hiking Katahdin in Maine, 10 miles round trip and lots of up, my feet felt great, unusual for me. Thank you so much for creating a product that can help those of us with arthritis to be and stay active. Bravo! My physical therapist recommended these SOLE footbeds while treating me for arthritis in my knees. He noted that I have high arches, and felt that these inserts might help with my foot pain as well as my knee pain. I was very skeptical as I had been fitted for custom orthotics by a podiatrist several years ago, and those inserts only added pain to the balls of my feet, for a cost of $300! But I tried these SOLE inserts anyway. Unbelievable! The relief was so immediate, and has continued on. We just took a three week trip, and spent much time walking in New York City. Unforgiving pavement no problem. I am recommending SOLE footbeds to my two children who are runners and to my sister who also has foot and knee pain. Very grateful. Foot And Knee Problems?? I run 5 miles a day and after many years of doing this I began having extreme foot pain and knee pain so bad that it stopped me from running. The doctor diagnosed me with plantar fasciitis and arthritis in my knees. He said my feet would heal by itself in due time but to stay off my feet, but I need to learn to live with the pain in my knees. I did for a while but it didn’t improve at all. I finally tried these foot beds and in under a week both problems disappeared completely. I will never wear shoes without them again. I love them. Thank you so much for making these. Excellent quality. This brand has the support I need. I have rheumatoid arthritis and it effects my feet. They are so comfortable and support the whole foot bed! Excellent product! Can wear them pretty much all day, and foot not sore or tired! Thank you, hugely recommend this product. SOLE footbeds optimize the natural motion of feet and ankles by equalizing pressure distribution for better balance and alignment. Our deep heel cups encourage the heel’s natural cushioning and neutralize alignment by preventing lateral movement. Without proper support and alignment, feet can become quickly fatigued, causing overuse injuries and weakening of the arch, leading to painful orthopedic issues. SOLE’s award-winning footbeds protect your feet while providing the unique support you need. SOLE’s orthopedic shape provides accommodative support for the entire foot. This support allows the foot to move naturally while preventing the weakening and collapse of the arch. SOLE’s heat moldable orthopedic bases adapt to your feet affording you custom comfort that is tailored to your feet without compromising the orthopedic shape. Your feet aren’t flat, why should your insoles be? Customers’ feet better after wearing SOLE. Customers recommend SOLE to a friend. Customers purchase SOLE again in the future. SOLE Footbeds are the most effective over-the-counter insole available and are trusted by millions all over the world. Our products are long lasting, have high customer satisfaction and are easy on the environment. Through pain relief, the perfect customizable fit and sustainable style, we’ll change the way you feel about your feet. We not only stand behind the quality and performance of every footbed but also the personal satisfaction of our customers.